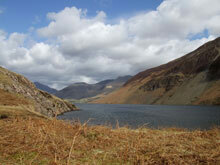 An area to visit if you wish to get away from the more popular tourist areas is Wasdale Head. On the drive you will pass the sombre Wastwater. Known for being England’s deepest lake the valley sides over towards your right appear to drop straight into the body of water. There is a footpath over on that side if you wish to get a little closer to the water. Wasdale Head is the place to start a strenuous walk to England’s highest mountain Scafell Pike. On the walk you can get views looking across and down to Wastwater and Wasdale Head. Also near to Wasdale Head is the steep but grassy slope of Kirk Fell followed by Great Gable and Green Gable mountains and requires a good level of fitness if all of them are to be done in a day. The views of Langdale Pikes on the approach to Great Langdale from Chapel Stile will leave a lasting impression. The characteristic peaks of Pavey Ark, Crinkle Crags and the Pike of Stickle can be explored and the view of Stickle Tarn is a well earned prize when reached on a warm sunny day. Thousands of years ago ancient man crafted stone axes from the rocks here. There are several popular inns where one can relax after a day’s walk. The sixty foot high Dungeon Ghyll Force waterfall can be visited. It may seem that the road has come to an end at the grassy floodplain with Bow Fell in the distance but it is an illusion for a left bend will take you around the western massif of Lingmoor Fell in a loop that will take you either eastward to Ambleside or westward to the Hardknott Pass. To reach Hardknott Pass you first have to negotiate the slightly easier Wrynose Pass which serves as a primer with what is to come. The Hardknott Pass drive is a 1 in 4 single track road. Views of the valley below and surrounding mountains are breathtaking. On the way down it is possible to stop and explore the ruins of Hardknott Castle Roman fort. Walkers may wish to take a look at self-catering accommodation for walkers in this area. It is always good not to have too far to drive during a walking holiday.